A gunman shouting “all Jews must die” burst into a Pittsburgh synagogue during a circumcision ceremony on Saturday morning, October 27, shooting dead 11 people. Neo-Nazi Robert Bowers, 46, wielding an arsenal that included a semi-automatic rifle and three handguns, also left six others wounded, including four police officers, during the 20-minute attack. 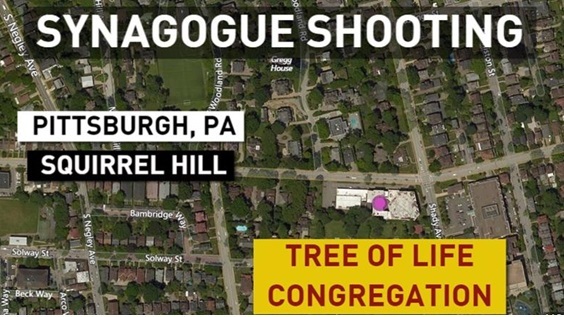 The massacre happened at the Tree of Life Congregation in a leafy suburb at the heart of a Jewish community in Pennsylvania. About 100 people were in the synagogue at the time. Saturday’s synagogue shooting in Pittsburgh is likely the deadliest attack on the Jewish community in the history of the United States, the Anti-Defamation League, an organization focused on combating anti-Semitism, said Saturday.